Cosmetic Dentistry improves the appearance of your teeth, gums, and your bite. The dental procedures of cosmetic dentistry involve color, position, shape, size, alignment and overall smile appearance. 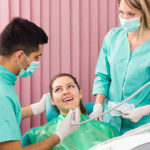 Most of the treatments of Cosmetic Dentistry consist in cover damage areas of the teeth, it means that if you have any compromised area, the treatment will help you to prevent future dental damage. Stained teeth can make you look older than you are. It’s a fact that your smile is the principal thing that people see most of the time, so that’s the first impression they get of you. If you want to look 2 or even 5 years younger you need to get treatment, a tooth whitening can be enough or if you need, you can have a dental implant and look even younger. The procedures of Cosmetic Dentistry are designed not only to make your teeth look better, but also make them stronger and that can help you to prevent future dental damage and to enjoy better your food. When you are getting older your teeth starts to get discolored and that can make you lose confidence. You will feel as you look, so if you look young you will feel beautiful and powerful, have self-confidence is important for everybody, your teeth can do. Dental Treatments can be very expensive, if you know you have damaged teeth and you just let them be, the future cost can be very high, you can avoid spending a lot of money if you start to take care of your teeth now if you know you need to, isn’t just about the appearance. All-on-4 combines dentures and dental implants to replace many teeth at once with maximum support and stability, without needing dozens of implants. Dental implants are titanium screws that are inserted into the jawbone to replace a missing tooth root. Typically a single dental implant is used to replace a single tooth. When a patient is missing many teeth, however, this would become prohibitively expensive and time-consuming. When a tooth is missing in the jaw, it leaves two noticeable gaps. Over time these gaps will close. This can result in teeth becoming crooked, not replacing one of those can lead to many more becoming damaged or crooked. That’s why is very important to replace missing teeth either with a dental crown or even a dental implant. Most dental treatments are very expensive, especially dental implants, but in Tijuana, you can expect to pay about 70% less than what you would pay in the USA for the same quality treatments. All In 4 Implant is a Clinic of Cosmetic Dentistry in Tijuana, Baja California only 5 minutes from the Border in San Diego. They have more than 15 years helping people recover the beautiful smile they used to have or that they want to have. They can help you too, and you can have the smile you always wanted. For over 15 years we’ve helped thousands of patients recover the beautiful smile they used to have. We are experts in smile reconstruction using the latest dental implant techniques and procedures. Is There an Age Limit to Dental Implants? Dentures or Implant Supported Bridges?